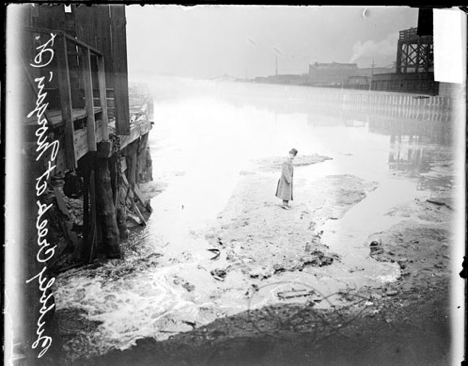 A man stands upon waste on Bubbly Creek, 1911. Chicago Daily News. On this date in 1837, the City of Chicago incorporated. Within half a century, it would (as William Cronon described in Nature’s Metropolis) be an engine of industrial capitalism, transforming the trees, plants, and animals of the Midwest into commodified lumber, grain, and meat. 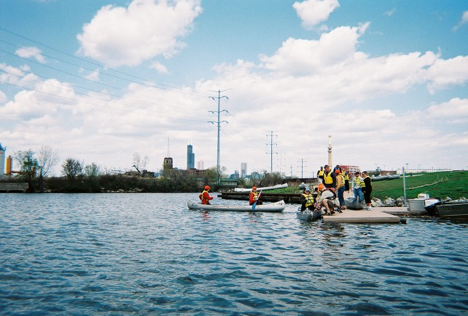 Roosevelt University students and faculty enter Bubbly Creek, 2009. Photograph by Laura Bryson. Chicagoans and people across the United States are still living with the environmental consequences of this history. As Mike Bryson and I observed when we team-taught “The Sustainable City” at Roosevelt University (and will discuss in greater depth in a forthcoming article), the Bubbly Creek fork of the South Branch of the Chicago River remains an example of waterway as sink for wastes more than forty years after the last slaughterhouse closed in Chicago. Chicago’s attention to environmental concerns, including finally moving to disinfect its wastewater, provides reason for optimism as the city turns 177. The current state of the stagnant and polluted Bubbly Creek, however, is a reminder that much effort is required to make Chicago a sustainable city in the future. Here’s to that effort as we wish the city a happy birthday. This entry was posted in history, publications, sustainability, waste on March 4, 2014 by Carl Zimring.